Robust desktop and mobile phone software is an important aspect of infrared inspection workflows. Software can help enhance and clarify images, add analysis and share professional-looking reports in applications spanning mechanical, electrical, electronic equipment and building diagnostics and more. It’s important to note that analyzing thermographic imagery accurately requires special training to take into account emissivity of objects and other factors that can influence temperature measurements by infrared cameras. Just as professional photographers use software to turn photographs into stunning works suitable for publishing or widespread sharing, thermographers use software as a tool to analyze and then enhance and fine tune thermal images so the information can be shared with managers and others. Good software fully utilizes the radiometric data supplied by the camera’s sensor to get the most out of the image or video. Multiple image or video formats – Process and export images in multiple file formats such a .jpg, .tiff, .bmp, .gif or .avi as well as proprietary formats that can tap more data for advanced analyses. Fluke infrared cameras can save in .is2 format, for instance, for further image processing and analysis in SmartView® software, and images can be exported from this software to many commonly used file formats. You may also choose to export the temperature data from the image to CSV or XLS format for further analysis. Edit and manipulate images – Adjust level and span, change emissivity, add markers, highlight boxes, reference images, color alarms. Combine visible light and infrared images – Adjust and blend visible and infrared images in order to better locate potential problem areas. This is the IR Fusion® feature in Fluke software. Live viewing and sharing of infrared images or video – View streaming data from your camera on your smartphone or computer. This is available via the Fluke Connect® mobile app on some models, for example. Share images in real-time across the internet for viewing by remote team members. Remotely control your infrared camera - Some software lets you activate auto focus or capture images and other functions without touching the camera, which can be valuable in potentially hazardous areas or tricky applications. Create templated or custom reports – Best-in-class software adds options for building and customizing reports to export in .pdf or .docx formats for sharing. 3-dimensional analysis – A capability of better software programs for thermal image analysis, viewing infrared images from different perspectives helps eliminate false positives and supports the identification of additional problem areas. 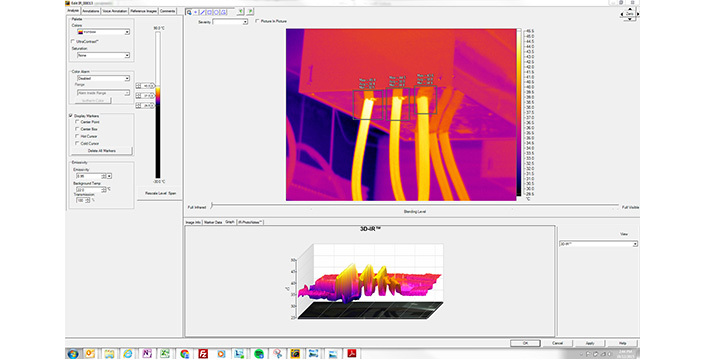 Fluke’s 3D analysis capability is called 3D-IR®. Side-by-side comparison – Important to predictive maintenance, side-by-side comparisons of images taken at different times are included in the Fluke Connect software platform’s Asset Health dashboard. Change color palette – Control colors in the image in order to make heat or cold easily apparent or view as grayscale. Annotations – Add text, audio, and additional visible light images to help add all necessary information about an application. 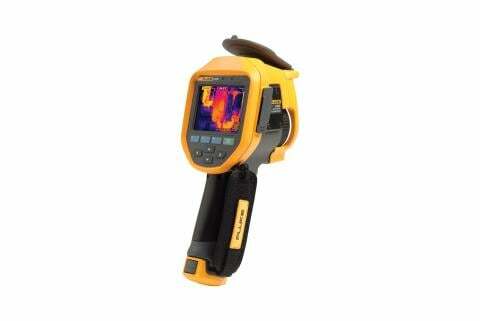 Categorize and catalog images – Tools to categorize, tag or catalog thermal images and associate with equipment. This feature is built into Fluke Connect Assets software.